You need to have a Globe SIM to activate the virtual card. This works on either Prepaid or Postpaid SIMs. The GCash App only works when you have a stable internet connection. 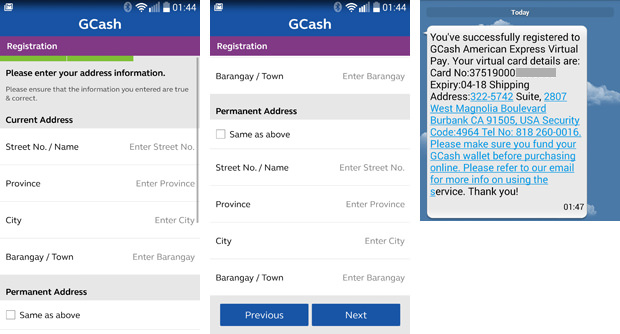 You can download the GCash App here. For first time registration, choose “Register”. Enter your 4 digit PIN, First Name, Last Name and Address. Make sure you enter the name as it appears on your ID in case you need to go through the KYC (Know-Your-Customer) process. The KYC process is needed when your transactions are P5,000 and above. Tap on “Next”. If the details are correct, Tap on “Register”. You will receive an SMS from 2882 confirming your registration. For those who already have a GCash App, launch the GCash App. Enter your 4 digit PIN. 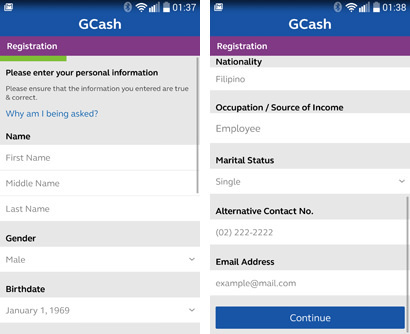 Once you’re inside the GCash App, click the icon found on the upper left corner of the screen and choose “GCash American Express Virtual Pay”. Register for the GCash American Express Virtual Pay. Make sure to enter details on all the fields. Tap on “Continue”. You must use an email address not associated with another GCash account. Continue with the registration and tap on “Next”. You will receive an SMS confirming your registration. And that’s it. Load you GCash and purchase on Google Play Store and Apple App Store, link it to your PayPal account and more. If by some chance, you forgot your security code, you can always request for a new security code on this page.